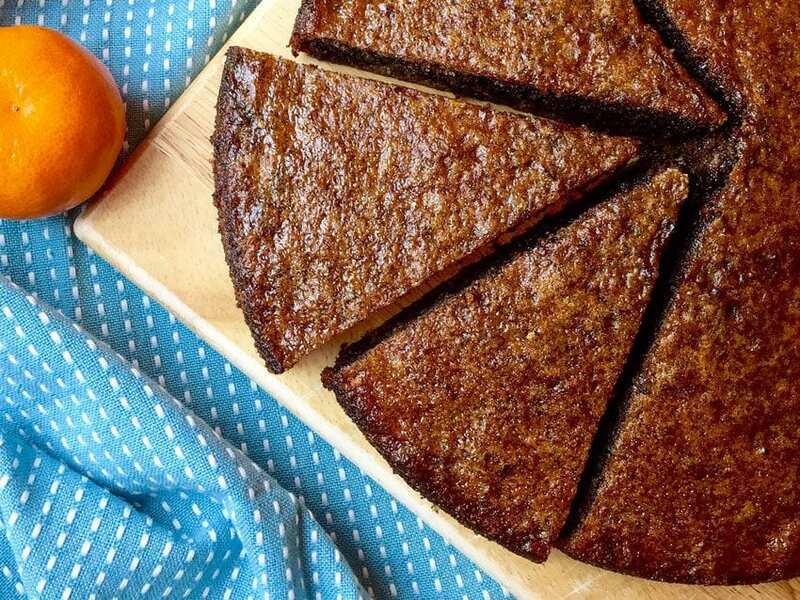 This easy brownie recipe is gluten free and sweetened with dates, not refined sugar. 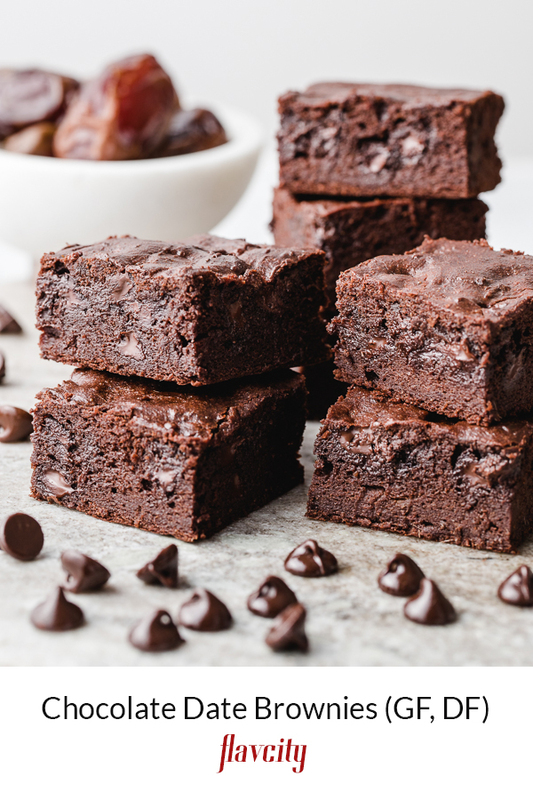 Blend the batter in a food processor then bake in the oven for 45 minutes for the best soft and gooey brownies. Dessi whipped up a batch of gluten free chocolate brownies recently that were insanely good. The best part about them was that she used dates as the sweetener, not sugar. As soon as I tasted these brownies, I knew she needed to write the recipe so we could share it on the blog. These homemade brownies are so easy to make. Just mix the batter in a food processor and bake in the oven. 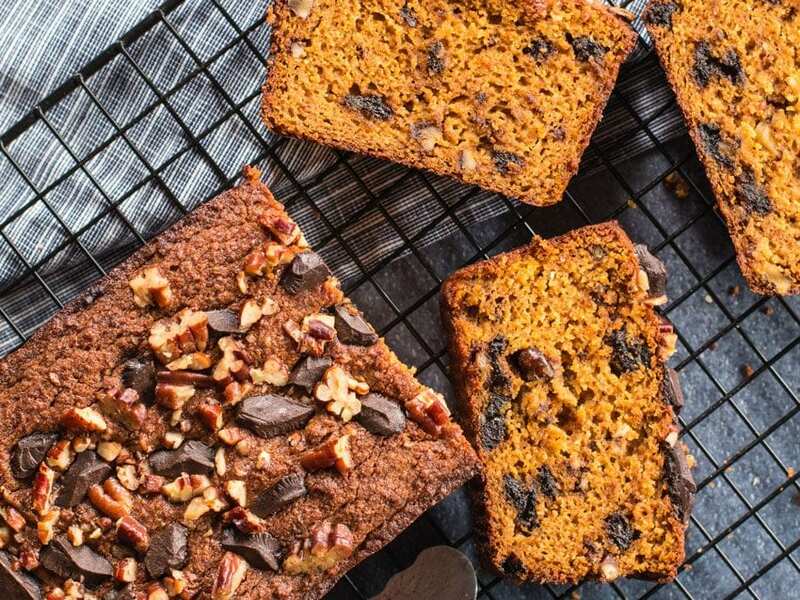 They are also gluten free, and I love the fact that dates are the only sweetener used – so brilliant! 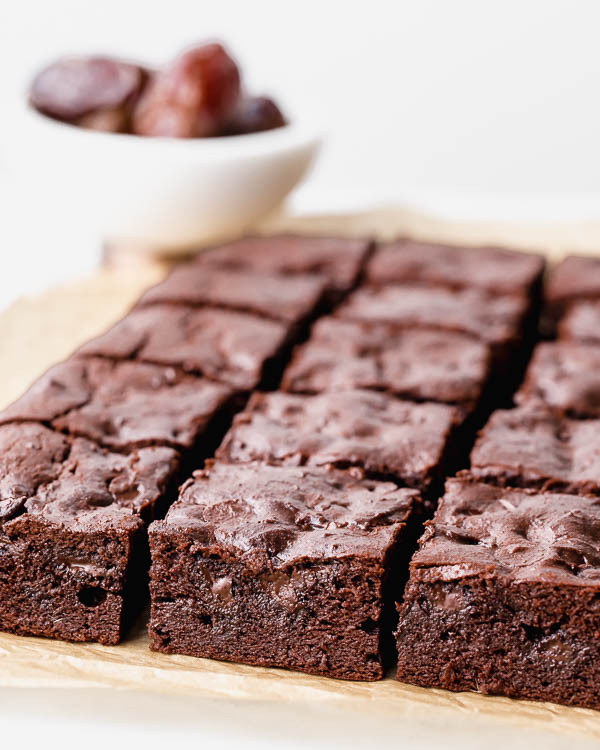 Just soak some dates in just boiled water so they soften up and blend them in with the brownie batter. It’s as easy as that. 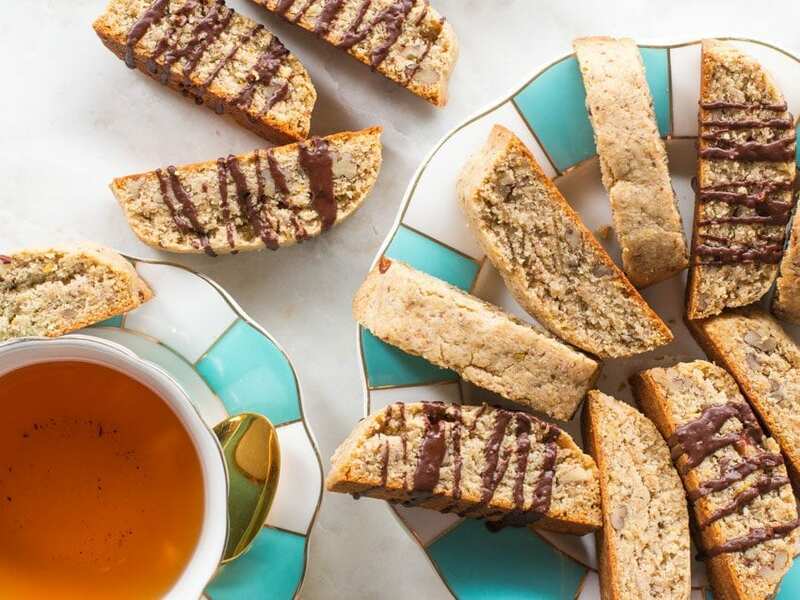 If you still have a sweet tooth after making these brownies, check out Dessi’s keto citrus biscotti and her gluten free chocolate orange cake. The only sweetener needed for this brownie recipe is dates. Start by soaking 12 ounces of pitted dates in just boiled water for 15 minutes so they can soften up. Add the soft dates to a food processor with 1/4 cup of water and puree until smooth. Next, add 4 eggs to the machine, one at a time. To make this brownie recipe gluten free, we used 1/2 cup each of fine ground almond flour and millet flour. The millet gives the brownies a nice texture. Add both flours to the food processor along with the coconut oil, cocoa powder, vanilla, salt, and baking powder. The brownies are also dairy free since we are using coconut oil. Pour the batter into a prepared baking dish and don’t forget to add some chocolate chips on top. Bake in the oven for 45 minutes at 350 degrees F or until a toothpick comes out clean. 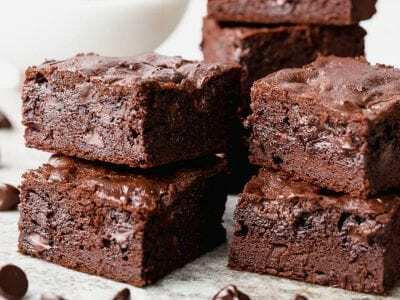 How Can I Make Brownies Dairy Free? You can easily make brownies dairy free by replacing butter with melted virgin coconut oil. 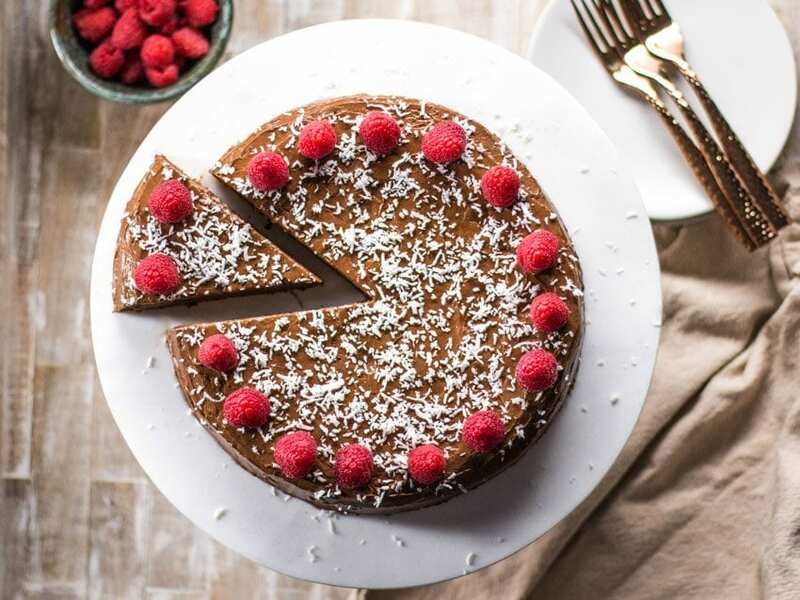 In this recipe, we use 1 cup of melted coconut oil, which is equal to 2 sticks of butter. The same is true if you wanted to use a neutral flavored oil like avocado. How Long Will Brownies Keep In The Fridge? Since brownies have eggs, they can only be storied in the fridge for 3 days. Or you can freeze the brownies for 3 months. The best way to reheat the brownies is to thaw first and place in a 300 degree F oven for 5 minutes. 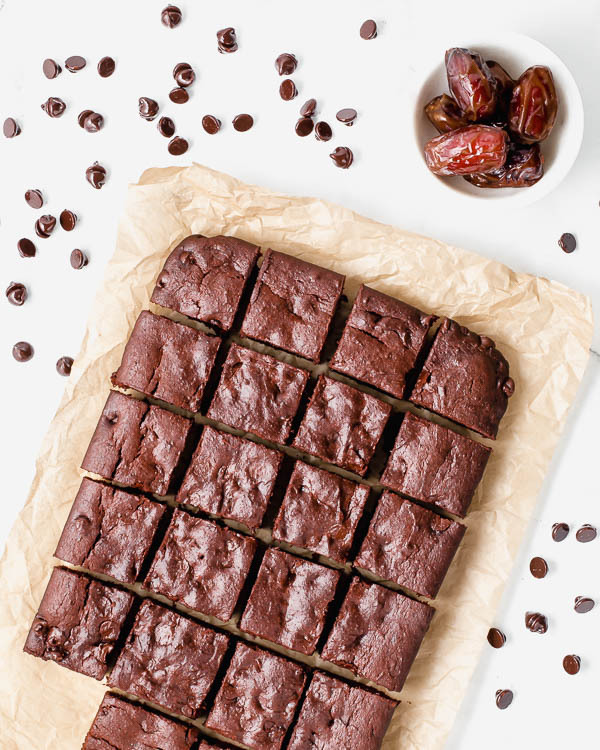 These gluten free brownies are sweetened with dates, and nothing else. The brownie batter is mixed in the food processor and the entire recipe is so easy to make. The result is a soft, cakey, gooey chocolate brownie. Preheat oven to 350 F. Soak the dates in very hot water for about 15 minutes. Drain them, but save ¼ cup of the liquid. Add the dates to a food processor (a 7 cup food processor works best) and process until the mixture turns into a smooth paste while adding the ¼ cup of water to it. Add the eggs one at a time, and process until each on until it gets incorporated into the mixture. Add the melted coconut oil and vanilla, and process until it gets incorporated. Add the cocoa powder, and process again. Add the almond and millet flours, salt and baking soda and process for another 20 seconds. Let the mixture rest for 5 minutes so the almond flour can hydrate. Pour batter into a 12 x 8 baking pan lined with parchment paper or greased well with coconut oil. Sprinkle the chocolate chips on top and use a spatula to push them into the mixture a bit. Bake for about 40-45 minutes or until toothpick inserted in the middle comes out clean. Let brownies cool for about 20 minutes then cut and enjoy! Store in refrigerator for 3 days or freeze up to 3 months. Can you post the nutritional facts please? These look delicious! We still need to pull those facts together. Hope you try them soon – they are delicious! I just made the brownies and they are the best! Even added a few walnuts to decorate the top. Can’t wait for your cookbook!